ROBERTS, Kenneth Allison, a Representative from Alabama; born in Piedmont, Calhoun County, Ala., November 1, 1912; attended the public schools and Samford College, Birmingham, Ala.; was graduated from the University of Alabama Law School in 1935; was admitted to the bar in 1936 and commenced the practice of law in Anniston, Ala.; practiced law in Talladega 1937-1942; elected to the State senate in 1942, but resigned the same year to enter the United States Navy and served until discharged as a lieutenant in 1945 with service in both Atlantic and Pacific Theaters; president, Piedmont Development Co., 1945-1950; member of Alabama State Board of Veterans Affairs and city attorney of Piedmont, Ala., 1948-1950; elected as a Democrat to the Eighty-second and to the six succeeding Congresses (January 3, 1951-January 3, 1965); unsuccessful candidate for reelection in 1964 to the Eighty-ninth Congress; resumed the practice of law until his retirement in 1979; counsel, Vehicle Equipment Safety Commission, 1965-1972; member, National Highway Safety Advisory Committee, 1966-1970; was a resident of Anniston, Ala., until his death in Potomac, Md., on May 9, 1989; interment in Arlington National Cemetery. Papers: In the Alabama Farm Bureau Federation Records, 1922-1993, approximately 47 cubic feet. The papers include correspondence between Kenneth Allison Roberts and Farm Bureau officials concerning legislation. A finding aid is available in the repository and online. Papers: ca. 1940s-1960s, approximately 5 cubic feet. The papers of Kenneth Allison Roberts includes documents, manuscripts, diaries, photographs, and artifacts. 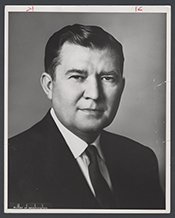 Included in the collection are correspondence files of interest to students of mid-twentieth-century Alabama politics. In addition, the collection includes Kenneth Roberts's appointments diaries and one diary-like booklet in which he wrote the script for a stump speech on behalf of presidential candidate John F. Kennedy. The papers also contain materials pertaining to his long-term interest in consumer and automobile safety and to the electrification of the Coosa River Valley by means of the construction of dams. Most of the artifacts associated with the collection are typical mementos of a successful congressional career. One group of artifacts, however, vividly recalls the 1954 attack by Puerto Rican nationalists on the U.S. House of Representatives, an attack in which Kenneth Roberts was wounded. Somehow he was able to secure, among other objects, the flag his assailants displayed during the attack. A finding aid is available in the library and online.